If you have ever seen a tree covered with pretty pink blooms (but not leaves) in winter, you likely encountered the eastern redbud bush. It is one of the first trees to flower each year. The species tends to have a short lifespan (on average up to 20 years) because of disease, pest attacks, and other environmental factors. Despite this drawback, many people find that the beauty this tree provides makes it well worth planting. With the tips that follow, learn how to care for the eastern redbud and about the shrub's history as well. The scientific name for this tree is Cercis canadensis. It shares a spot in the Fabaceae (pea) family with other species like the Kentucky coffee tree, wattles (Acacia spp. ), powder puff tree (Albizia julibrissin) and wisteria (Wisteria Sinensis). Eastern redbud is the standard common name for the genus. 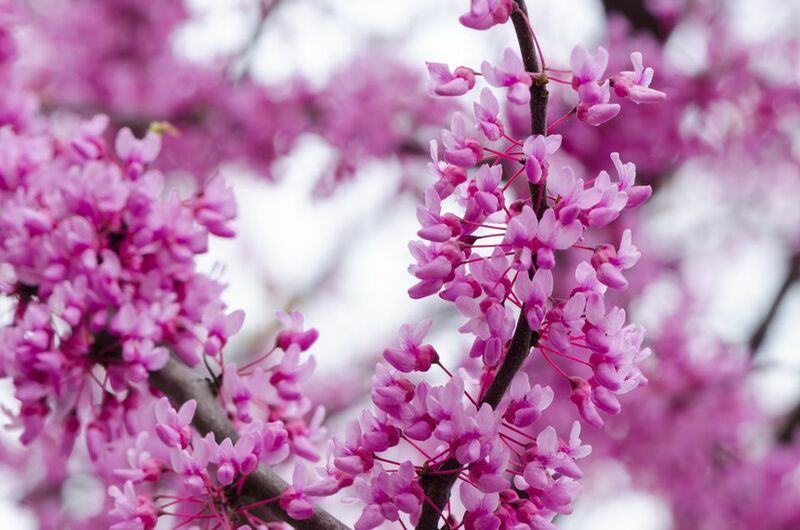 It can be referred to as simply "redbud," but there are other species that use this name. Some also call it Judas tree, though this is more aptly applied to Cercis siliquastrum. The name came from a legend stating that Judas Iscariot hung himself with this type of tree after betraying Jesus Christ. Gardeners consult hardiness zone maps to learn which locations are most suitable for plants. The eastern rosebud, for example, can grow successfully in Zones 4 to 9. It originally comes from the Midwestern and Eastern United States. This tree reaches 20 to 30 inches tall and 20 to 35 inches wide. It forms into a vase shape and is prone to forming multiple trunks. If you have a site in mind that gets full sun or some shade, the eastern redbud will grow well. You get the optimum flowering potential if you have full sun. The leaves of the bush are heart-shaped (cordate) and are approximately 3 to 5 inches across. They are green for most of the growing season, fading to a yellowish-green in the fall. As mentioned below, 'Forest Pansy' has purple leaves. The pea-like flowers make it obvious that this plant is a member of the Fabaceae family. The flowers appear in late winter or early spring, even before the leaf buds start unfurling. Most varieties are pink, though there are some that produce white flowers. The fruit is also like those of its relatives. The blooms give way to green pods filled with black seeds. As the summer goes on, the pods turn brown and dry out. The rosebud is thought to be a drought tolerant tree after a proper establishment period of one to two years. If you prefer white flowers, look for the "Alba," "Royal White" and "Dwarf White" varieties. "Silver Cloud" features variegated leaves in shades of green and cream. "Forest Pansy" has rich purple leaves. "Flame" has double flowers. "Convey" is a weeping variety. If you like butterflies, the eastern redbud will bring them to your garden. You can also use it to attract hummingbirds. This is a good tree to plant if you have a black walnut tree in your garden as well. It can tolerate the allelopathic nature of the tree and will tolerate the juglone toxin better than many plants. The eastern redbud shows the best growth in moist sites. It does not like wet feet, though, so proper drainage is essential. Both acidic and alkaline soils will be tolerated. It can also work if you have clay soil, but you will definitely need to make sure that it drains. Prune this bush in winter before blooming starts. Start when young to create a strong structure and control multiple trunks if desired. As with many Fabaceae species, this tree can harness nitrogen from the air through a process called nitrogen fixation. Unless symptoms and tests show otherwise, you should not need to fertilize it. You can take steps to prevent these pests from getting into your garden, such as barriers to keep large and small animals out and natural insect repellents to keep critters away. The rosebud may require care, but the beauty it adds to your garden makes this shrub worth your time and attention. Should You Have an English Oak in Your Yard?